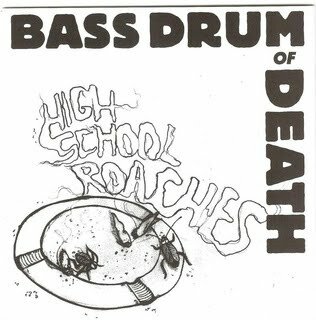 CATS PURRING: BASS DRUM OF DEATH - "HIGH SCHOOL ROACHES"
Oxford, MS raunchy hitmakers BASS DRUM OF DEATH have a new 7" EP available HERE from Baby Don't Records. It's called HIGH SCHOOL ROACHES and you can download a monstrous track called GET FOUND from our cuddy buddies over at WEEKLY TAPE DECK. They'll be adding a few tour dates to the MYSPAZZ soon, so stay tuned!